I made a peplum top a little while ago and wanted to try my hand at a peplum skirt. Since I wanted it to be wearable even after the peplum trend fades, I decided to make it a removable piece. This will be a semi-long post, so please see full tutorial after the jump. 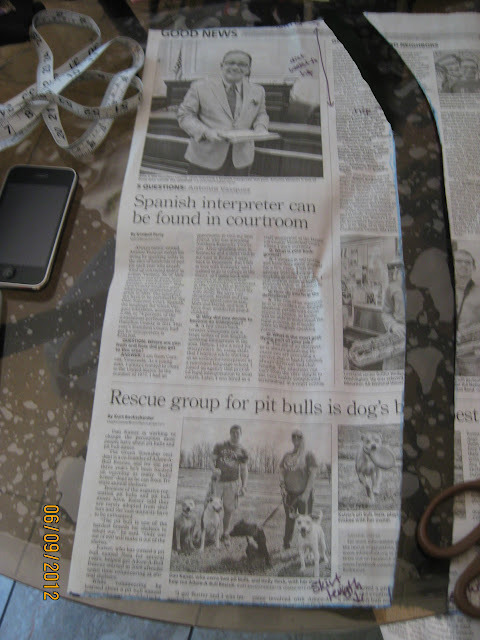 Note: Commercial patterns are much more beginner-sewing friendly with step by step directions on how to sew. 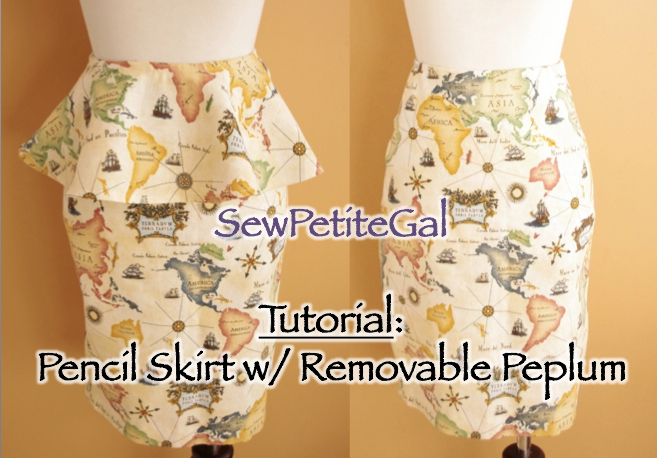 This part of the tutorial just covers how to draft your own pattern to mimic the fit of your existing pencil skirt. Note that some skirts may have slightly different measurements for the front and back so make sure any discrepancies are recorded too. Starting with the front of the skirt, take your measurements and divide them by 2. 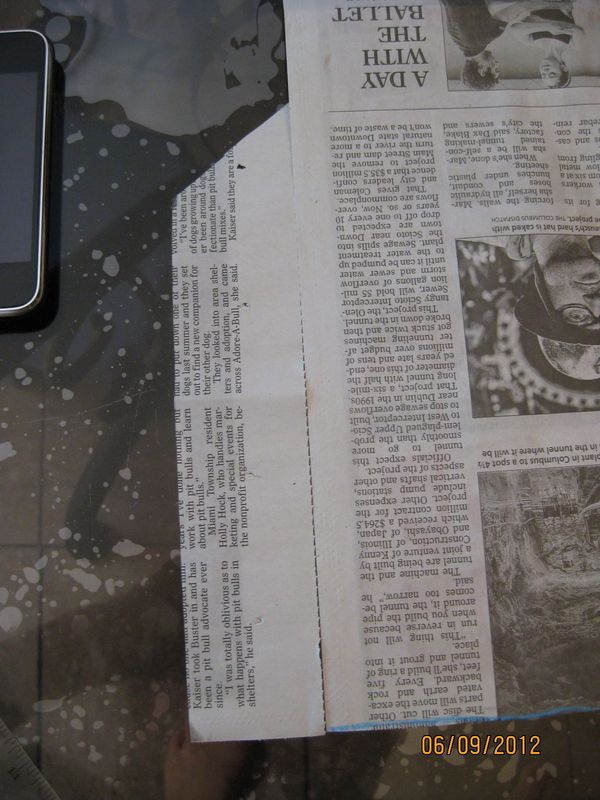 Mark these numbers on your newspaper. Note: If you wish, add about 1/2" to your measurements for your seam allowance and 2" to the skirt length for hemming. I usually do this mentally when I cut the fabric using the pattern. 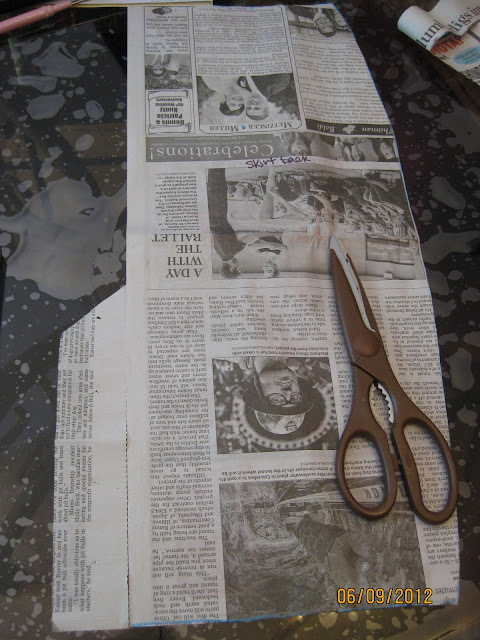 Place your existing pencil skirt over the newspaper and use it's shape to draw a line connecting your measurements together. Cut out your skirt shape. To make the pattern for the back of the skirt, do the same thing as you did above but using the back measurements. I'll explain the side fin below. 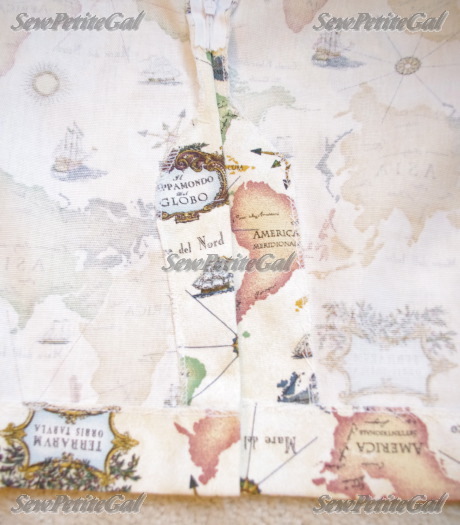 Note: You'll want to add a 1" seam allowance because you'll be sewing along both sides. To make a slit in the back, you'll want to add this little fin shape to your skirt back pattern. Simply cut a 9x2" rectangle and then angle one side. Tape this fin to the straight side of your skirt back. The fin allows you to have a smooth, uninterrupted slit. 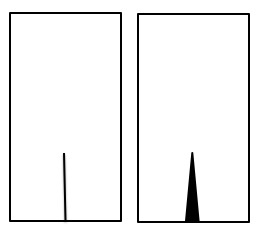 If you simply cut a slit and finished the edges, you'd have a gapped slit. This is really a matter of preference. Making a peplum is essentially like making a shorter circle skirt (a great tutorial with clear instructions here by Dana Made It). I should have looked on the internet before I did this to take the guesswork out. Oh well. Here I made 2 half circles and joined them together. Take your waist measurement and add a little extra for wiggle room and seam allowance (I used 2"). Now divide by 6.28. This will give your radius measurement. Fold your fabric in half. From the top folded corner, mark your radius measurement at the edges and 3-4 places in between. Connect the dots to create an arc. Determine how long you want your peplum to be. Short and sweet or long and dramatic? Maybe something in between? Add your desired peplum length to your radius and make the same types of marks from that top folded corner as above. Connect the dots to create your 2nd arc. Cut along the lines and you'll get something like this. Unfold it to get your 1st half circle. Repeat process for the 2nd half. Connect your 2 half circles by sewing down 1 edge. The unsewn edge will be how you get in and out of your peplum. Finish all the edges by folding a little inwards and sewing. Add a closure (I used a hook) to the waist of your peplum. Now you've got your pencil skirt with a removable peplum! The peplum helps define my waist for a more feminine shape whereas the pencil skirt plus semi-fitted top plays up my rectangular torso. If I were to wear the pencil skirt alone, I'd opt for a blouse-ier top to hide this problem. In the world of peplums, do you prefer peplum dresses, tops or skirts? This really turned out amazingly! I love that you made the peplum removable...genius! Amazing!!! I also love the skirt print too! wow, love this idea. it seems so simple, why dont more skirts come with this option?!? awesome job!! Wow that is such a great idea - a removable peplum! I love the pattern of the skirt too! Very unique! You should totally open a store with all your creations! So cool!!! Congratulations!! Great DIY :) Love the skirt with the peplum! Amazing tutorial, S! I love the removable peplum. What a creative way to stay on trend without sacrificing classic appearance. You did such an amazing job!! I can't wait to get back into sewing again after my exam is over!! That is genius!! Love the print. So gorgeous! Thank you for the detailed tutorial - the skirt looks terrific! :) I love everything about it. What a great idea! I'm learning to sew and I just made my first skirt - I'm so excited to be finally able to utilize all your fantastic tutorials. My guess is that you used a stretchy fabric? I didn't see any zippers to help with putting it on/off. I had no idea you could make a removable peplum, that is an awesome idea! If I recall correctly the peplum was big in the 90s...we'll see how long it takes for this to resurface. That is a great idea! That would be great if some retailers offered that option! Wow, this is awesome. I just found your site. The concept is so clever! And the print on the fabric works so well for this. Wow! You make it sound so easy. I love the clear step by step instructions. I'm always in awe of your creativity. I could never, in a million years do something like this. I think it's great that you made the peplum removable--it truly makes the skirt a more versatile piece. great tutorial, it turned out amazing. Oh and I love the fun print. I'm definitely trying this out! So great that the peplum is removable! Looks great on you! Cute fabric and great tutorial! Thanks SPG!! Hi! May I ask where you got that wonderful material?!?! Do you have any more of this fabric and would you consider making another pencil skirt with it? Would love to have one. Yea, those swingy peblums...I never knew what their name was, but I've always thought that were so classy. Quick question: what would happen if you put a full circle on the tshirt instead of a half circle? Hi! You can absolutely cut a full circle out all at once. I find it easier to do half circles and connect them in addition to being able to better maneuver the fabric when cutting.